My oldest boy is very resistant to writing. It is a real source of frustration to me. We use reading eggs as our main English program. We all like it. He can read and spell well enough, but he very rarely writes anything. I have seen a number of articles linking writing skills to fine motor development, and suggesting that it doesn’t need to start until aged 7. This argument makes sense to me, but I don’t think that is the issue here. He is capable of writing quite well when he gets the urge. He just will not do writing exercises. We have tried writing stories, and sending letters to people, but the idea of a whole page full of words is too much for him. He is happy to label maps and diagrams, but that is not really enough to count as writing practice. Worksheets make for a good mid range size of work, but he goes to extraordinary lengths in his refusal to do them. Anyway, my youngest boy randomly pulled a game off the shelf yesterday and said he wanted to play Silly Sentences. I bought it for $2 at a second hand shop a while ago, but we have never used it much. It is a pretty neat game. Words are printed on cards that click together like a jigsaw puzzle. Different word groups are marked with different colours. Nouns have an orange stripe on them, adjectives have a blue stripe, and so on. The cards only click together if they make grammatical sense. A lot of the cards also have pictures on them to prompt reading. I liked the colour coding a lot. Without having to try and explain different groups of words, I was just able to say ‘you need a green word next,’ and that was enough. We had loads of fun playing with these, and only really stopped because it was time for bed and I wanted to finish on a good note. 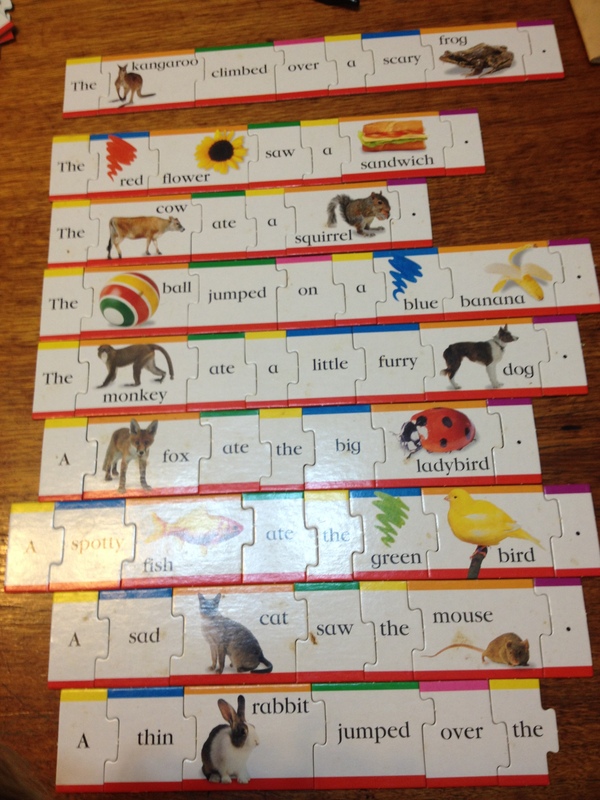 My youngest boy put together about ten sentences and was very proud of himself for being able to read them. My eldest didn’t make so many, but he did copy all the ones he made into his exercise book. I think it helped that the sentences are all kind of nonsensical. ‘The caterpillar jumped over the spotty hat,’ is the kind of thing you end up with. It was great to see him write a whole series of sentences. I think his refusal to do it for so long has been more a lack of confidence than ability. This game was just the perfect amount of writing and level of fun for him to really engage with. I think we might have stumbled onto the right tool to help move him up to a new level of writing. 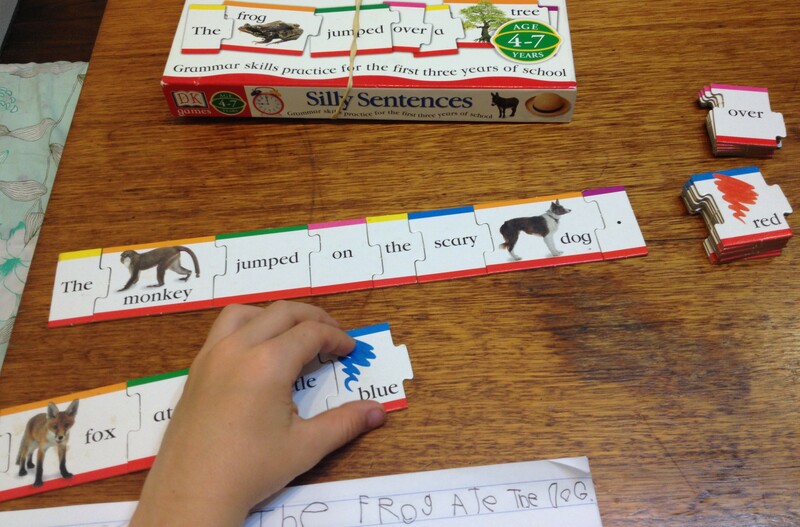 This entry was posted in English and tagged bloke, homeschool, play, writing. Bookmark the permalink. It’s so funny to read this, because I was just thinking about this issue tonight. My son (8) has beautiful handwriting, but also very little interest in writing anything. He will if he needs to. I’ve tried letters and stories, but he is at best uninterested, and at worst resistant or upset. I’ve backed off for now, hoping that something will arise that gives him a reason to want to write more. Reading your post makes me wonder how common this is. I really don’t know how common this sort of thing is. I suspect it is quite a deal more than it appears. Every sentence has to finish in a laugh. That style of humour seems to appeal to most young kids. Excellent tool. I think i have that game somewhere too–and never used it. Perfect for my 6 year old son, who also doesn’t like writing. Legos yes, writing no. We love Mad Libs at our house this looks very similar. My son was very relucant to write and still is at times. We use Silly Sentences as well to encourage writing and to see who can make the silliest sentence! It’s lots of fun. Making it fun is such a key to success. It doesn’t matter what the subject is.